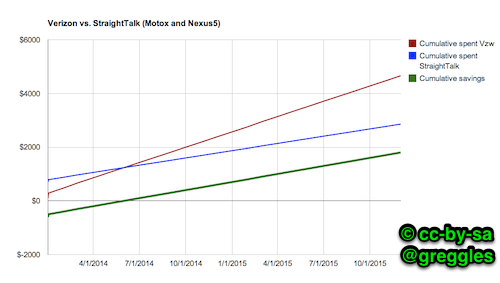 The Nexus5 seems like a great phone. Totally unlocked, so I can switch plans (or countries) whenever I want. That's something I couldn't do (at least not without paying a lot) with Verizon. It's a top of the line phone in every way I can see. Some people don't like the plastic on the back of it. I find the plastic to be a great material. It's lightweight and seems plenty strong to me. The phone is very fast, the screen is great, and did I mention it's not on a contract? 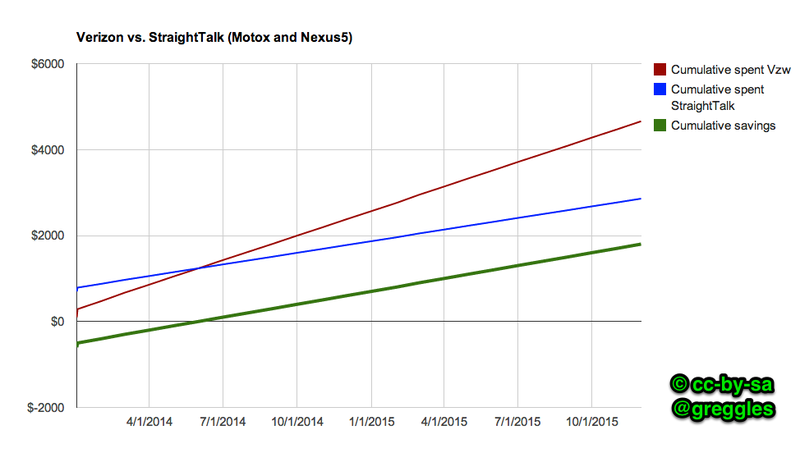 StraightTalk is an "MVNO" for T-Mobile and AT&T's networks. When you get a "straighttalk" plan you are basically buying access to either the T-Mobile or AT&T network but getting the website and customer service of StraightTalk. Their website has a few bugs and is hard to use, but...it gets the basics done. If the plan is cheap enough then I can put up with a website that's a bit rough around the edges. After all, I've had bad customer service from AT&T and Verizon and was paying them a lot more! A Nexus 5 phone takes a micro sim card. Straight Talk offers sims for either AT&T or T-Mobile. For my home and travel patterns, AT&T has a much better network. There are some places where T-Mobile is better. I like T-Mobile's company spirit, but their network is just not good enough. WalMart sells the Straight Talk AT&T Compatible Micro SIM with $45 monthly service card The sim alone is $6.88 or bundle it with a month's service and save. They don't seem to sell it IN their stores, unfortunately, so you have to pay for and wait for shipping. Amazon has it, but for a lot more money! You can also get it from StraightTalk.com itself, but the shopping experience is pretty abysmal. I really suggest Walmart. Once it arrives in the mail, activate your SIM. You can even "transfer" or "port" in your existing number so that you don't have to tell everyone a new number. If you want to transfer your number be sure to do it while activating your SIM. They may not be able to port your number if you have already activated your SIM (in which case they'll ship you a new sim in ~5 days, but there may be a small fee for that). Click settings and then under "Wireless and networks" click "More"
Go down and click "Mobile Networks" and then click "Access Point Names"
You will see a lot of other fields. Do not change their values. Then in the top right use the 3-dot context menu to hit "save." Turn your phone off and then on...and done! Enjoy! Sprint for a super old Kyocera monster in 2000. But the G1 on T-Mobile was just so slow, so I moved to a Droid Incredible on Verizon with unlimited data. This was...2010. Not that long ago! In 2012 I got a Droid4 which has 4g. As Verizon rolled out 4g I started getting faster internet on my phone than I got via CenturyLink DSL (we're now on Comcast, which is faster than either). I often use 10GB of data in a month. Because unlimited. Sadly, if I want a new subsidized phone then Verizon is going to force me to get a new contract without the unlimited data. I can't justify their prices (we pay $190 in a typical month) if I'm not getting unlimited data. I can't justify holding on to an old-ish phone when the new ones are better.